I'm continuing my series on interesting Upper Canada pioneers who happen to be ancestors, and in that vein, this post is about Pamila Draper, my husband's 2nd great aunt, whose claim to fame is defending her home against drunken men using only a pair of tongs. As someone who was born on the trail while her United Empire Loyalist parents fled into the untamed Canadian wilderness, Pamila's life is worth passing on in this modern world of ours. Researching Pamila's father, Rev Joel Draper Sr, born in/near Boston, Mass, around 1889, and the families of several Draper siblings who made the journey into Upper Canada together is very difficult as the siblings never revealed the names of their parents on any documents such as birth or marriage records, simply referring to them as Father Draper, Mother Draper, or left blank. Pamila's mother, on the other hand, was Mary Crittenden, born in Oneida, New York around 1886. Mary's lineage is well documented and my research has taken it to the shores of Connecticut where a ship of Puritan Crittendens landed, and then farther back to Henry Crittenden/Cruttenden, born 1530 in Kent, England. As for Pamila, she was born somewhere in New York on Aug 20, 1804. 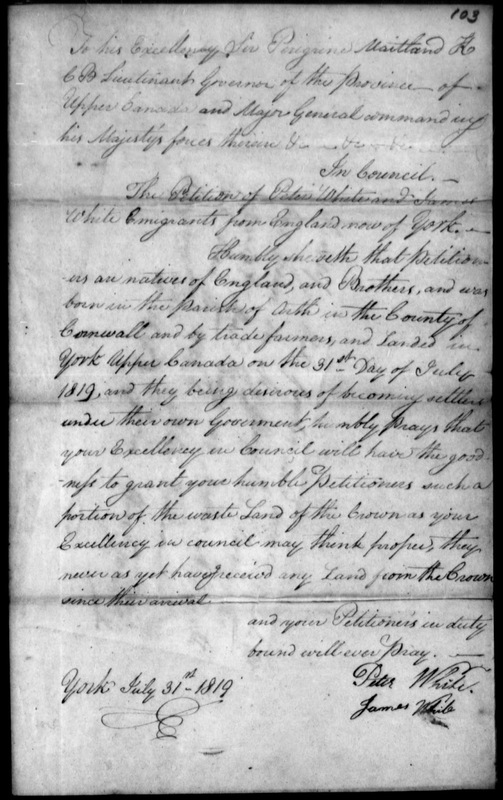 We don't know exactly when the family crossed into Canada, but a family record at the Georgina Pioneer Village & Archives shows that on Aug 14th, 1807, Joel Draper bought land in North Gwillimbury, in the northern part of York county, Upper Canada. Joel and Mary farmed their land and raised all 10 of their children into adult-hood - somewhat of an accomplishment in those dangerous times. 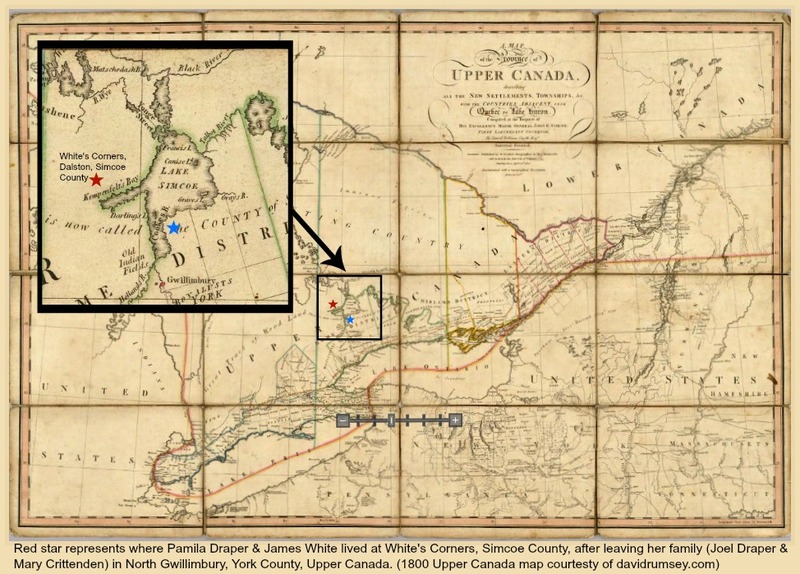 As records are scant from those early days, we don't know exactly when James White claimed Pamila Draper for his bride, but she was 25 yrs old when their first child was born - far from her loving family in North Gwillimbury. Upper Canada Land Petition No 103 for Peter White and James White. Included with Peter and James's land petition was a signed letter of reference by Alexander Montgomery, a farmer, and his son, John, stating that Peter and James had been sober and faithful harvest workers. 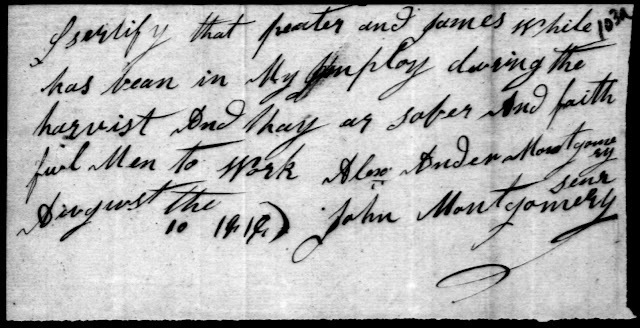 What's fascinating about this letter is that over the years, John Montgomery owned several York taverns, and would eventually own the infamous Montgomery's Tavern which will forever stand in Canada's history as the battle site of the 1837 Upper Canada Rebellion. Upon receiving their grants for 100 acres each, James claimed Lot 26 on the east side of Simcoe County Concession 1 (now Hwy 93) in the Township of Oro, while his brother, Peter also claimed Lot 26, but on the west side of Concession 1 which put him in the Township of Vespra, and so the place became known as White's Corners. Peter White, a Wesleyan Methodist lay minister, was the first to conduct religious services in the area and in 1855 built a Wesleyan Church on his property. I thought it very interesting that James built a tavern first, and then a decade after his brother's church opened, James donated a portion of his own land for a Congregational Church. However, according to census and death records, James and Pamila remained Wesleyan Methodists. 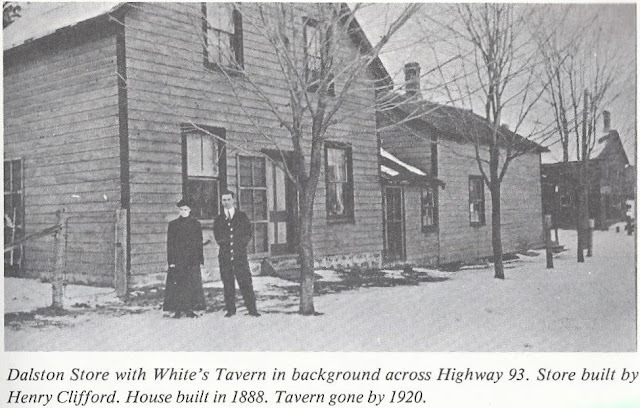 This is the only photo I've found of this historic corner with White's Tavern (far right). Photo taken from The Story of Oro, Second Edition 1987. In 1830 when James and Pamila's first child was born, White's Corners had officially become Dalston. The following map shows how far Pamila moved away from her family when she married James White (blue star to red star). As you can see on this 1800 map, compared to the United States in the bottom right, Upper Canada is barely settled except for along the shores of the St Lawrence River, Lake Ontario, and Lake Erie. All the open space you see is Indian country. In the upper left corner beneath the insert it shows the label, Chippewa Hunting Grounds. And Huron trails criss-cross land that settlers were now moving onto. James White's wife, (Pamila Draper), was of U.E. Loyalist descent, being a daughter of Joel Draper, of North Gwillimbury. Like other people born in this country, and used to its hardships, she made a sturdy, progressive, pioneer's wife. In the early days, the Indians travelled the Penetanguishene Road in considerable numbers, as it was the well beaten highway between the two lakes. Once when a pack of half-drunken Indians called at their place and became troublesome, she chased them with a pair of tongs, which they feared more than a tomahawk, as they did not know what the tongs were, or what injury they might inflict greater than a tomahawk might do. It doesn't state what type of tongs Pamila brandished on the men, but these images show two types that would have been in use during this time period. The Pioneers of Old Ontario by W.L. Smith, 1923, rephrases the words, but gives Hunter the credit for Pamila's story. Also, local history books for both Oro and Vespra townships recount this story of Pamila Draper White. This past June I visited White's Corners. 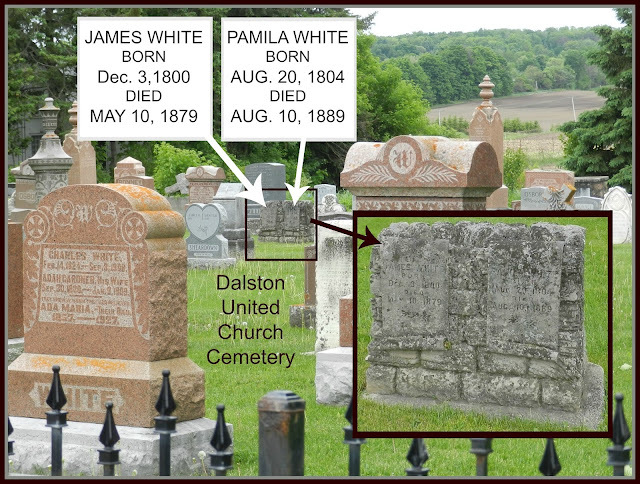 There is a historical marker in front of the Dalston United Church and Cemetery dedicated to James's brother, Peter White who owned the land and started that first church so many years ago. His memorial is the white plaque on the grey headstone beneath the historical marker. A few days previous, I had bought the cemetery directory and so I knew who was buried where, yet I still spent time exploring the graveyard. I don't think I can adequately explain the profound emotion I felt as I stood in front of the combined headstone for Pamila Draper and James White. The woman buried beneath my feet was my husband's 3rd great-aunt, and therefore my children's 4th. But it wasn't just that. As a historian, I have a deep respect for Pamila and women with her inner strength and character. Women who accept life's challenges, wherever they lead. Women who take a stand against threats to their home and family. Pamila couldn't have known that the liquored-up men would run from a pair of tongs. History doesn't say if there was a real confrontation or simply a perceived threat. It doesn't matter. Pamila probably grabbed the first thing she could think of at the time, and in doing so, she wrote herself into the history books as a pioneer of note. I hope you've enjoyed this walk through historic Upper Canada with me. Do you have someone in your family tree that deserves to be talked about in today's 21st century? Please share with the rest of us. Those hand written documents are amazing. Indeed, Debra. I enjoyed your posts on the War of 1812 where you explored the settings and watched re-enactments of the battles. Very interesting. They helped squelch my want to see them myself. If only it had been last year. As for the hand-written documents, it's because of the internet and the digitization of records that anyone is able to see such gems. The ones you see are part of the Library and Archives Canada (LAC) which is a tremendous resource for anyone searching early Canadian history. Much of the pre-Confederation land, military, and census records, etc are online now, although not indexed as you would find on a paid site like Ancestry, and it's so easy to use. 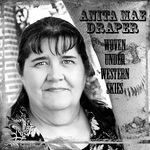 Great post, Anita Mae. I love how thorough you are with your ancestry investigations! What a story, too. Thank you!